Some trendspotters say the next big thing for international cinema is a swing to the young generation of Mexican directors, post-Arturo Ripstein and post-post Bunuel. 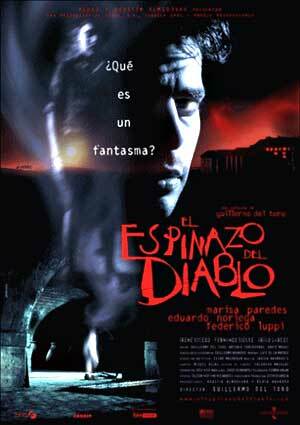 Perhaps, but there's a way to go when The Devil's Backbone by Guillermo del Torro (Cronos, Mimic) is touted as a seminal film of the Mexican New Wave. Del Torro is good at spooky atmosphere, and he's utilized a first-rate locale, an isolated, abysmally run-down fort (?) baked under the hot, yellow Mexican sun, and which stands in for an orphanage. But the acting is clunky, and the story is straight-to-midnight movie stunted and not very believable. Why is it set in Spain in the 1930s during the Civil War? I have no idea. A twelve-year old boy, Carlos (Fernando Tielve), is brought to this odd orphanage run by a weird, moody gothic couple, and where an unexploded bomb dropped by a Fascist plane sits in the courtyard. Other characters: a ghost boy, Santi, who creeps about unhappily each night and provides a few genuine scares; an evil, sadistic handyman, Jacinto (Eduardo Noreiga), against whom all the orphans finally revolt. The distributors have packaged The Devil's Backbone as an arthouse picture. It plays far more like a Franco-North American spaghetti western.